Social networking is now the most popular online activity anywhere in the world. Visiting social networking sites, especially Facebook, account for nearly 1 in every 5 minutes that we spent on the Web making it as the most engaging online activity worldwide. Social networking sites now reach 1.2 billion users around the globe or 82 percent of the world’s Internet population age 15 and older that accessed the Internet from a home or work computer. A report by the research firm comScore showed that Filipinos spent an average of 8.7 hours visiting social networking sites in October 2011, landing the Philippines on the sixth spot in the list of social networking countries. 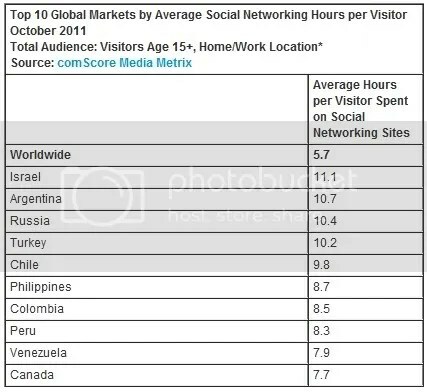 The rankings had a worldwide average of 5.7 hours where Israel led all countries by spending more than 11 hours on social networking sites during the month. Argentina ranked second at 10.7 hours, followed by Russia (10.4 hours), Turkey (10.2 hours) and Chile (9.8 hours). The figure for the Philippines may, however, not reflect the true statistics because the it only include Web traffic from homes and workplaces and exclude visits from public computers such as Internet cafes or access from mobile phones or other mobile devices. Observations show that big number of Filipinos still access the Internet through i-cafés. The activities we do when we visit and spend time on social media vary from checking the activities of friends, family and acquaintances to marketing and sales promotions of our products and services. As a blogger, I spend most of my time on Facebook, Twitter and Google+ to interact with fellow bloggers with the aim of getting them to visit my blog posts. In your case, how do you spend your time on social media?